Wood elves are reclusive, but less so than the almost feral wild elves. Also called copper elves, they have coppery skin tinged with green, and brown, green or hazel eyes. Their hair is usually brown or black, with blond and coppery red occasionally found. * Ability Adjustments: +2 Strength, +2 Dexterity, -2 Constitution, -2 Intelligence. * Hardiness vs. Enchantments: Immunity to magic sleep effects, +2 racial bonus to saving throws against enchantment spells or effects. * Low-Light Vision: An elf can see twice as far as a human in starlight, moonlight, torchlight, and similar conditions of poor illumination. 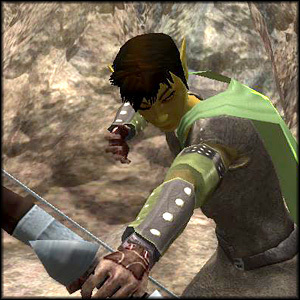 * Weapon Proficiency: Elves receive the Martial Weapon Proficiency feats for the longsword, rapier, longbow (including composite longbow), shortbow (including composite shortbow) as bonus feats. * Keen Senses: +2 racial bonus to Listen, Search, and Spot checks. An elf who merely passes within 5 feet of a secret or concealed door is entitled to a Search check to notice it as if she were actively looking for it. * Favored Class: Ranger. A multiclass wood elf's ranger class does not count when determining whether she takes and experience point penalty for multiclassing.